For the month of September, the Handwriting is Fun! Blog will be sharing insights about the role of Occupational Therapy in the classroom. In recent years, the role of OT, in general, has been changing with the waves of healthcare and education reforms. Despite a certain amount of turmoil and confusion where those changes may have thrown us a curve ball, most often they have provided us with an opportunity to make a difference in an area in which we’ve longed to see an improvement. Client involvement is an excellent example of a concept that can turn the tide in school-based and pediatric practice. Although this concept is relatively new in pediatrics, it remains an important one to embrace as we enter this new generation of healthcare and education perspectives. In that light, this week’s article focuses upon the concepts that define a client-centered therapeutic approach and the implications for its use in all facets of occupational therapy, including pediatrics and in the schools. The rehabilitation process can be defined as a “reiterative, active, educational, problem solving process focused on a patient’s behavior (disability)” that uses assessment, goal setting, intervention, and evaluation tools to achieve its objectives. The objective of the rehabilitation process includes maximizing the client’s participation in his or her environment and to minimize the effects of pain and distress on the client and client families. (1) In recent years, the approach to rehabilitation has moved from a “predominantly medical one to one in which psychological and sociocultural aspects are equally important.” This has resulted in transforming the rehabilitation process into a client-centered practice where the personal perspectives and backgrounds of the client are becoming increasingly important. The process of rehabilitation is complex (1) and works within a structure that demands the collaboration of a multi-disciplinary team who works toward client-specific goals and encourages involvement of the individual and his or her family. (2) In the past, this group included professionals from the medial, therapeutic, and ancillary staff of the hospital, school, clinic, or facility where the client was receiving services. Family members and caregivers in the adult environment were invited to participate in team meetings, training, and decision making events along with the client. The client’s level of participation in the process rested on his or her capacity for understanding the choices and for making decisions. A child-centered rehabilitation process, however, typically includes the professionals on the team and the family members responsible for the child’s wellbeing. The child most often serves in an “invisible role” on the team appearing for the assessment and therapeutic interventions but rarely for events that would determine his or her goals for therapy. The move toward a client-centered practice has not completely turned the corner into pediatrics. The rehabilitation process in the pediatric practice remains the same regardless of the arena within which it is carried out. The provision of therapy in the clinic or hospital, the home or the school, begins and ends with the same tools as it seeks to achieve the highest level of independence for the clients. Our clients are young, ranging from birth to around 18 years of age, and present with a wide range of strengths and needs. They are all individuals and deserve strategies for care that respect them as such. However, results of a 1995 study of the participation of adult patients in their rehabilitation process conducted by Northen et al. (5, quoted in 6) determined that the “maximum potential of client-centered practice was not realized throughout the treatment process.” This was linked primarily to inconsistencies in the use of structured methods for encouraging client participation in the initial process as well as during the ongoing rehabilitation process. Given the lack of data available that tracks client involvement in the pediatric practice, it is of value to discuss the implications of client-centered rehabilitation with children. Client-centered therapy and its implications for pediatric outcomes. These two components rely upon the development and implementation of a team-based strategy that is designed to enhance both client and therapist involvement in the client-centered process. This type of strategy is based upon three factors for success: rapport, a working reliance, and a stable relationship. Rapport. Children rely on trust within each of their daily interactions with teachers, therapists, and school personnel. Trust in a therapeutic partnership begins with the gathering and sharing of information about the client and the therapist, the demonstration of “cooperative intent” during the initial stages of the alliance, and the regulation of the student’s involvement in decision-making events. Trust is built during informal discussions about activities that each enjoys, challenges they have faced, and goals for the future. It continues to develop when each understands that the other can be flexible and accept changes in plans or challenges that push comfortable boundaries. And, most importantly, trust is built when the therapist recognizes the student’s need to have less distraction or increased interaction in order to be successful. Working Alliance. As the rapport continues to develop, the therapist and client begin to focus on the goals and tasks that will define the student’s therapy. Eleanor Cawley, MS., OTR/L, in her book, The Student Interview, stresses that the use of effective communication techniques can produce benefits that improve diagnosis and outcomes, treatment adherence, (and) patient satisfaction….” (9) She refers to communication strategies that build a working alliance as avenues of exchange that can help students to build “a sense of self and of personal identity.” While her information targets the adolescent population, students of any age will experience a sense of belonging and importance when the therapy plan is shared with them and decision making involves them at an age-appropriate level. Perhaps one of the most significant facets of the development of rapport and a working alliance is the therapist’s and the student’s combined response to the success or failure of a therapy technique. Tickle-Degnen, in her AJOT article, “Client-Centered Practice, Therapeutic Relationship, and the Use of Research Evidence,” (4) suggests the use of a recording tool** that documents the goals of the treatment and whether or not the task or strategy is accomplishing them. In addition, in an effort to enhance the working relationship, she suggests that “occupational therapists should incorporate client satisfaction and frustration ratings” into this recording tool. 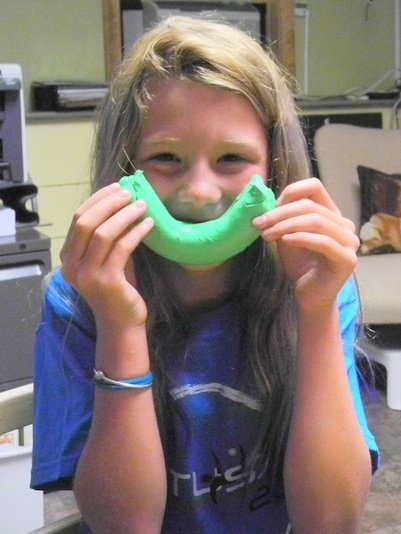 Children can easily express their feelings of frustration with a task, as well as their sense that it is beneficial. 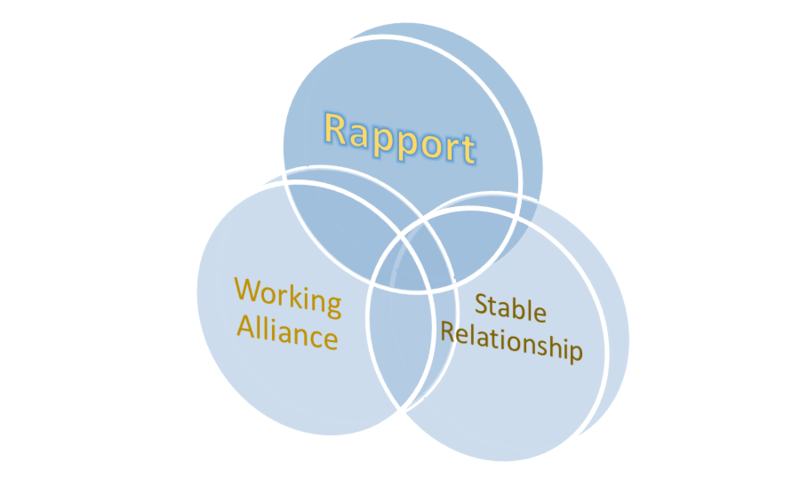 The working alliance is a “living relationship” that continues to expand and contract as it becomes a stable working relationship. We, as the service provider have control over our knowledge base and our feelings of comfort or insecurity that surround the implementation of a client-centered approach to therapy. We can influence a student’s intrinsic motivation by attending to the development of rapport, a working alliance, and a stable working relationship and by adapting the process to meet his particular learning, cognitive, and physical needs. We can influence the environment with the demonstration of success within our personal practice of client-centered therapy and with discussions about the benefits for increasing a client’s sense of worth and self-efficacy. 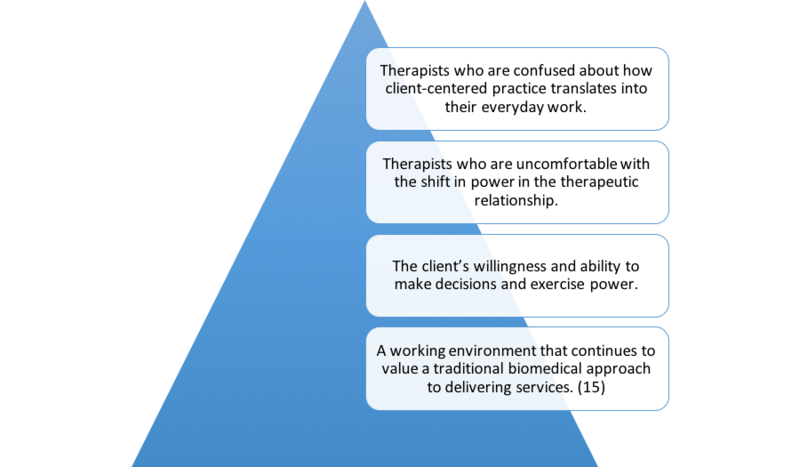 A client-centered approach to therapy is not a new concept. The term was coined by Carl Rogers, an American humanistic psychologist, in his 1939 book, The clinical treatment of the problem child. In it he stresses the importance of “individuality, holism, sense of self, the influence of the environment, values development, actualization, and goal-directed behavior” in both the individual’s overall development and the development of the client-therapist relationship. (15, qtd. in 14) The Philosophical Base of Occupational Therapy (16) defines “participation in a meaningful occupation (as) a determinant of health.” It stresses the same concepts of therapy as Rogers, describing the environment, intrinsic individual factors, occupational contexts, and inherent characteristics of the activity as significant factors to consider as we develop a focus and outcome expectations to encourage and enhance our clients’ engagement in meaningful occupations. Children, our students and clients, deserve the opportunity to use “occupation” as a change agent, as well as an individual means to achieve their goals, and to experience a client-centered therapeutic approach as a means for active participation in their service plan. Photos are the property of the contributors of Pixabay and their use should include the link provided to the photographer’s source. *The information in this section was adapted from Reference No. 4. Wade, D. T., and B. A. DeJong. “Recent Advances: Recent Advances in Rehabilitation.” Bmj7246 (2000): 1385-388. Web. 15 Sept. 2015. <http://www.ncbi.nlm.nih.gov/pmc/articles/PMC1118051/pdf/1385.pdf>. Wressle, Ewa. Client Participation in the Rehabilitation Process. Diss. Linköpings Universitet, 2002. Linköping: UniTryck, 2002. Print. Tickle-Degnen, L. “Client-Centered Practice, Therapeutic Relationship, and the Use of Research Evidence.” American Journal of Occupational Therapy4 (2002): 470-74. Web. 15 Sept. 2015. Maitra, K. K., and F. Erway. “Perception of Client-Centered Practice in Occupational Therapists and Their Clients.” American Journal of Occupational Therapy3 (2006): 298-310. Web. 15 Sept. 2015. Northen, J. G., Rust, D. M., Nelson, C. E, & Watts, J. H. (1995). 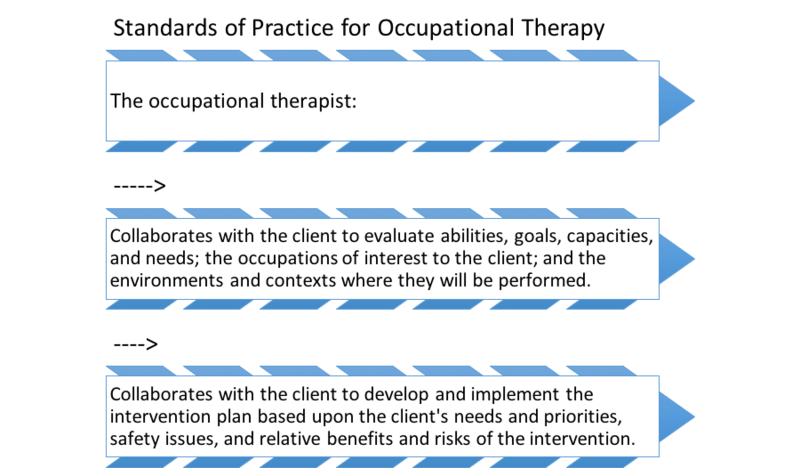 Involvement of adult rehabilitation patients in set- ting occupational therapy goals. American Journal of Occupational Therapy, 49, 214–220. Astin, Alexander W. “Student Involvement: A Developmental Theory for Higher Education.” Journal of College Student Development Sept/Oct 40.No. 5 (1999): 518-29. Web. 16 Sept. 2015. Cawley, Eleanor, MS, OTR/L. The Student Interview. 2013. Print. Gan, C., K. A. Campbell, A. Snider, S. Cohen, and J. Hubbard. “Giving Youth a Voice (GYV): A Measure of Youths’ Perceptions of the Client-Centredness of Rehabilitation Services.” Canadian Journal of Occupational Therapy2 (2008): 96-104. Web. 16 Sept. 2015. Carini, Robert M., George D. Kuh, and Stephen P. Klein. “Student Engagement and Student Learning: Testing the Linkages*.” Research in Higher Education Res High Educ1 (2006): 1-32. Web. 16 Sept. 2015. Engel-Yeger, B., L. Nagauker-Yanuv, and S. Rosenblum. “Handwriting Performance, Self-Reports, and Perceived Self-Efficacy Among Children With Dysgraphia.” American Journal of Occupational Therapy2 (2009): 182-92. Web. 8 Sept. 2015. Fredricks, Jennifer A., and Wendy McColskey. “The Measurement of Student Engagement: A Comparative Analysis of Various Methods and Student Self-report Instruments.” Handbook of Research on Student Engagement. New York: Springer, 2012. 763-82. Print. Corring, D., and J. Cook. “Client-Centred Care Means That I Am a Valued Human Being.” Canadian Journal of Occupational Therapy2 (1999): 71-82. Web. 16 Sept. 2015. Rogers, C.R. (1939). The clinical treatment of the problem child. Boston, MA. : Houghton Mifflin. For the month of September, the Handwriting is Fun! Blog will be sharing insights about the role of Occupational Therapy in the classroom. In recent years, the role of OT, in general, has been changing with the waves of healthcare and education reforms. Despite a certain amount of turmoil and confusion where those changes may have thrown us a curve ball, most often they have provided us with an opportunity to make a difference in an area in which we’ve longed to see an improvement. 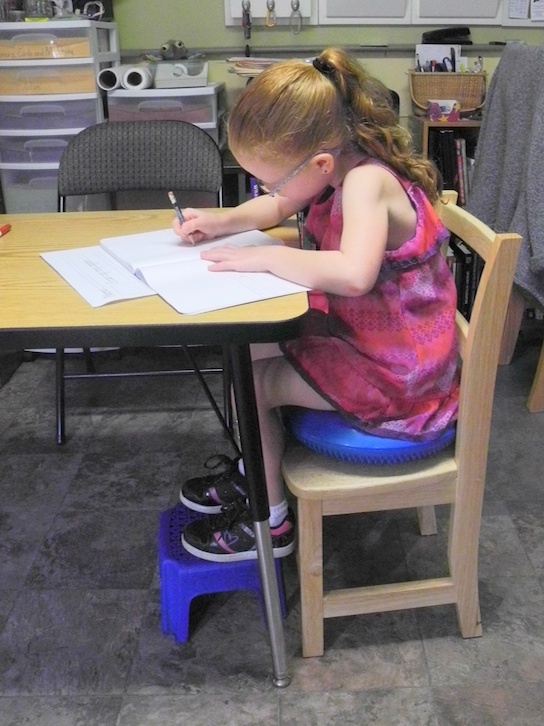 Occupational Therapists have recently received an increasing number of referrals to consult with teachers and staff about the behavioral needs exhibited by their clients, as well as those displayed by other students in the school. In that light, this week’s article focuses upon techniques for becoming a “behavior detective” to guide us in uncovering the underlying causes for students’ behaviors in school and to offer tried-and-true strategies for helping them to manage their feelings and stresses. No child wants to misbehave. Rules exist in homes, schools, and communities in attempt to maintain a peaceful and calm environment. It’s important that children with and without special needs learn to follow the rules of the classroom setting. As students grow into adulthood, their success is dependent on their own ability to adhere to rules while controlling impulsivity and behavior. Children often exhibit behaviors when they are overwhelmed, confused, or asked to complete a non-preferred task. The creation of rules is critical to helping students know exactly what to expect. Therefore, rules should be consistent throughout all settings and consequences delivered. It’s critical to remember that children with special needs often experience co-morbid conditions. Examples include: reflux and other gastro-intestinal disorders, sleep disturbances, and processing delays. School settings themselves can be quite overwhelming for students with sensory processing disorders. There’s so much to consider when working with children who exhibit difficult behaviors. 1) Be objective. Don’t form opinions of a child based on a specific diagnosis or from a written report. There’s a saying I use often, “If you’ve seen one child with autism, you’ve seen ONE child with autism.” It’s true for all children with special needs! They are people first. 2) Consider the skill level of the child. If a skill has not been learned and rehearsed, then the child will have difficulty generalizing the skill. Perhaps, bad habits were formed in earlier years or grade levels. Re-evaluate what’s already been done and rehearse again. Remember that no child wants to fail. 3) Evaluate for receptive and/or expressive language delays. Many children simply need more time to process a directive. This is especially true in a busy classroom setting. Ensure the instruction giver has the child’s full attention prior to giving a command. 4) Consider time of day. Often, my new OT students forget that everyone has a different time of day in which they function best. We all experience different body rhythms in sleep/wake cycles, hunger/thirst/digestion, etc. I’m a late morning person. I am simply not at my best first thing in the morning. No one can change that as it’s my body’s physiological condition (interoception). 5) How has the task been presented? This is the ‘before’ or antecedent. Antecedent information includes the tone of voice of the direction giver, visual vs. auditory command, child’s sensory arousal/state prior to the command, child’s attention to command and child’s underlying ability to actually follow commands. Not many people consider the BEFORE…..in fact, it’s more common in the school setting to consider the RESULTING behavior. It’s a veteran behavior detective who can form non-biased conclusions as to the events that occur prior to the child’s tantrum. BONUS tip…Does or has the child been given attention for the behavior? Is he perhaps seeking a reaction from the teacher, clinician, or students? If this is the case, keep an even tone when giving directions and choose your battles. For example, I was called in to observe a third grader with lower-functioning autism. She consistently threw her paper onto the floor when the teacher gave a writing assignment. Upon observation, the teacher instructed her to ‘pick it up’ each time. The teacher and other students were consistently distracted and frustrated. I suggested the teacher simply ignore the behavior. The student threw everything from her desk onto the floor and no one looked or responded. After a week without attention, she stopped tossing paper onto the floor. Yes, this is a simple example, but it’s applicable to many other situations. I’d like to offer some advice to help children transition smoothly. Review rules and consequences BEFORE a tantrum and when the child is quietly listening. Remember that fight or flight reactions are CHEMICALLY driven and once the hormone (adrenaline) is released, it takes time for a child to calm and organize. Please don’t attempt to teach a child who is in a tantrum. I’d bet you do not want to learn a new skill or receive a lecture when you are upset and need to re-group. Finally, utilize visual strategies for transitions. Adults rely on the use of calendars, timers, and electronic devices for transitions and reminders. In the school, provide a written or picture schedule of transition times. Give verbal warnings or countdowns prior to changing activities. It’s best to provide consistency and use the same strategies consistently throughout the day. If the student prefers to learn visually, allow the use of a visual timer or schedule for transitions. For others, provide verbal warnings at various intervals of time beginning at least ten minutes prior to transition time. The most important takeaway from my post today is to remember that there is ALWAYS a reason for everyone’s behavior and it’s our job to investigate. Being a behavior detective is not easy, but the rewards are well worth your effort. Your students will thank you for it! Cara Koscinski, MOT, OTR/L, is passionate and excited about providing quality treatment to children with special needs. As a homeschooling mother to her own children born with autism, Cara co-founded Aspire Pediatric Therapy, LLC, to provide quality therapy for autism and Sensory Processing Disorder at schools, in homes, and in centers around the Pittsburg area. 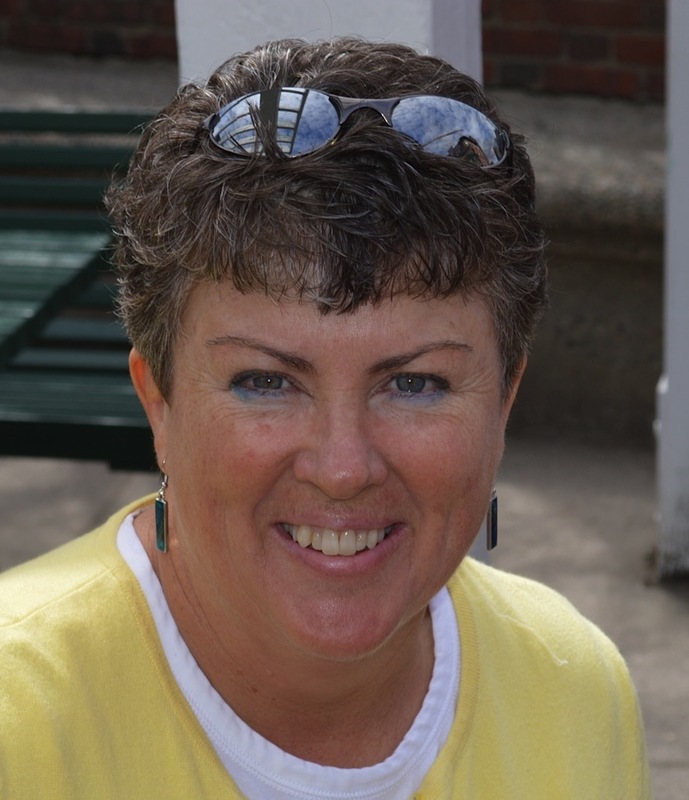 Cara is the author of The Pocket Occupational Therapist, winner of the 2015 Family Choice Award and recommended in the Autism Spectrum Quarterly as a “Great Resource for Families and Professionals.” In addition, she has authored her latest publication, The Special Needs SCHOOL Survival Guide, and The Weighted Blanket Sensation (coming in Winter 2015). Cara has served as an adjunct clinical instructor for the Duquesne University Occupational Therapy program and was the recipient of the Duquesne University’s Innovative Practice Entrepreneur Award. For more information about Cara, or to contact her directly, please visit her website, The Pocket OT. Photos are the property of Cara Koscinski and are not to be used in any fashion except as links to this blog post or the Pocket OT website without the expressed, written permission of the author. Announcing a new #OT blog! Announcing a new blog on the Handwriting With Katherine Site! In just 7 days, Handwriting With Katherine will be offering their readers a new resource for #OT tips. Beginning on September 10, the Go-To-For-OT Blog will share insights and delights from new writers. Three very experienced pediatric occupational therapists have joined together in this new venture to publish their work and join the therapy blogger adventure. Each Thursday of the month, the Go-To-For-OT Blog will feature one of the blogger’s work. The writers will bring their individual perspective and focus to the site, connecting with you during discussions of their particular pediatric OT specialties. Please join us beginning on September 10, and each Thursday thereafter, to learn, grow, share, and chat with these amazing occupational therapists. Please welcome our new writers to the blogging scene!